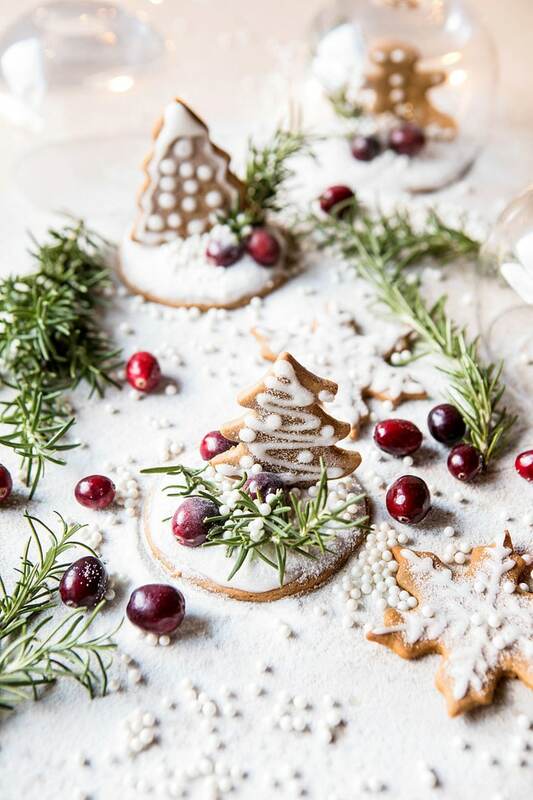 Getting crafty today with this fun Gingerbread Snowglobe Place Setting. Quick Announcement: So excited to share that I am now offering signed bookplates for anyone who purchases the HBH cookbook. Just fill out this form by December 19th (for delivery by the 24th). All you need is your order number. Give the gift of a signed HBH cookbook this holiday season! Christmas Eve is exactly a week away, and for some of us, that means scramble time. Or at least time for some last-minute DIY projects like these snowglobes. Aren’t they cute?! I am so excited for the coming week. My family that’s not already here in Colorado, will begin arriving on the 23rd and I can’t wait. This coming week I am really hopping to get ahead on work and try to take a breather for the first time in over a year. It’s so hard to believe how fast this year went. It was such a great year and I am exited to be ending it with my family and taking some time to chill, because I have big plans for 2018. Is it weird that I am excited already for what’s to come? One of my main goals for Christmas Eve and Christmas dinner this year is to actually have a cute table setting. I set tablescapes all the time for projects I am working on (did you guys catch my latest Crate and Barrel Christmas dinner? ), but when it comes to actually setting a nice table for the family holiday dinners, it never, ever happens. Oh, I try every year, but when it gets down to it, the chaos of our large family gets in the way. Plus, there’s the fact that I am moving food from my little barn up to my parent’s house (where there is much more room for all of us), so yeah, it’s chaos and then some. 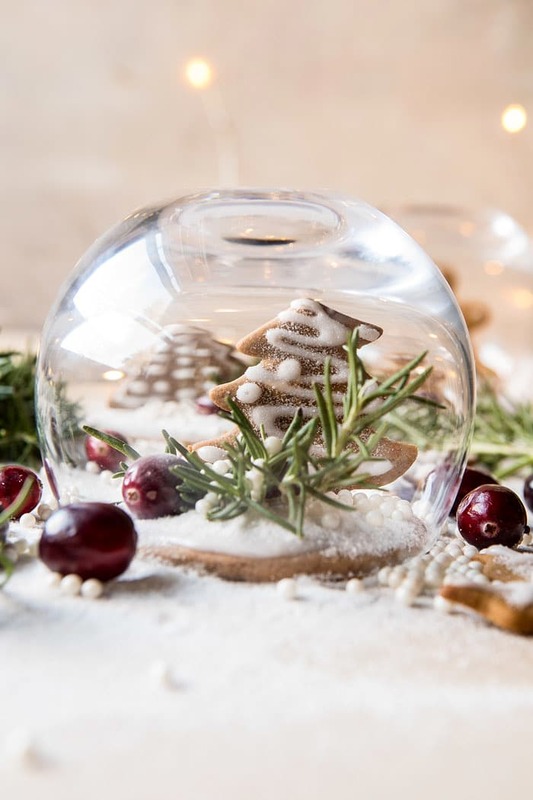 This year I’m making a cute table happen, no matter what, and it’s all starting with these gingerbread snowglobes…that I LOVE…even if they may end up looking like a kid put them together by the time I get to them. I’m not really sure how I came up with this idea, maybe hours of Pinterest scrolling and a serious love for all things Christmas, but however it happened, I’m so glad it did. 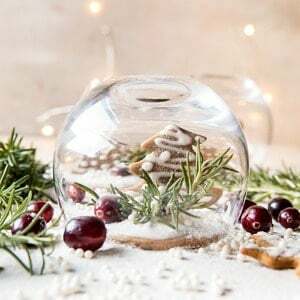 These snowglobes are not only cute, but they’re easy to make and use supplies found in your kitchen. Best part? When you’re done with them? You can eat them!! Cool. Cool. So here is how these are made. First you’ll want to start out by making sure you have a stemless wine glass with a wide opening. I used these glasses found at Crate and Barrel. Finding the right glass is the most important part. 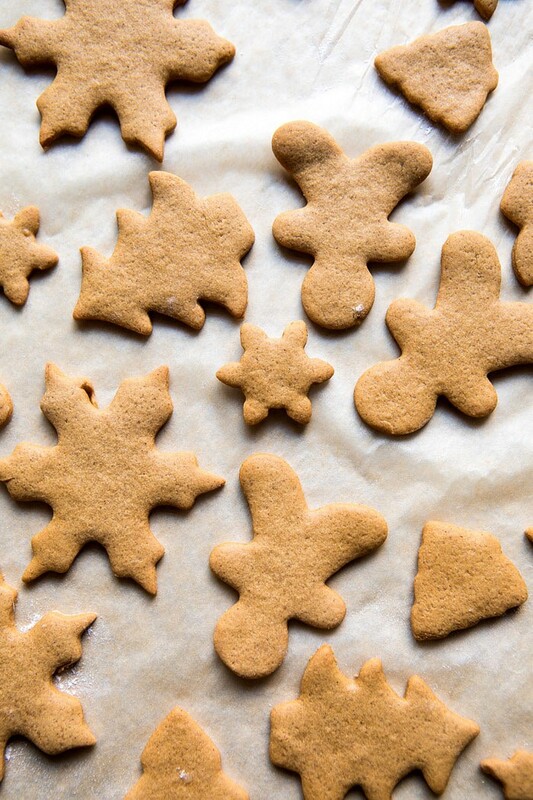 Once you have those you’re ready to start making some gingerbread. My recipe is pretty simple, it’s heavy on the ginger and cinnamon, and very no fuss. You’ll want to cut out circles that are just a smidge smaller than the rim of your wine glass, and you’ll want to cut out shapes that are small enough to fit inside your wine glass. It’s important to bake the shaped cookies first because you’ll want use those cookies to make a small indent into the bottom of your circle cookies (see photo above for some guidance) while the circle cookies are still hot. This is how the shapes will stand upright. Then just, frost and decorate your globes as desired. Simple and fun! To use these for a place setting, transfer the cookies to a plate and then carefully place the wine glass upside down over the cookie. To see how I used these for a Christmas tablespace, check out the post I created for Camille Styles. This is one of my most favorite holiday dinners I’ve done yet! 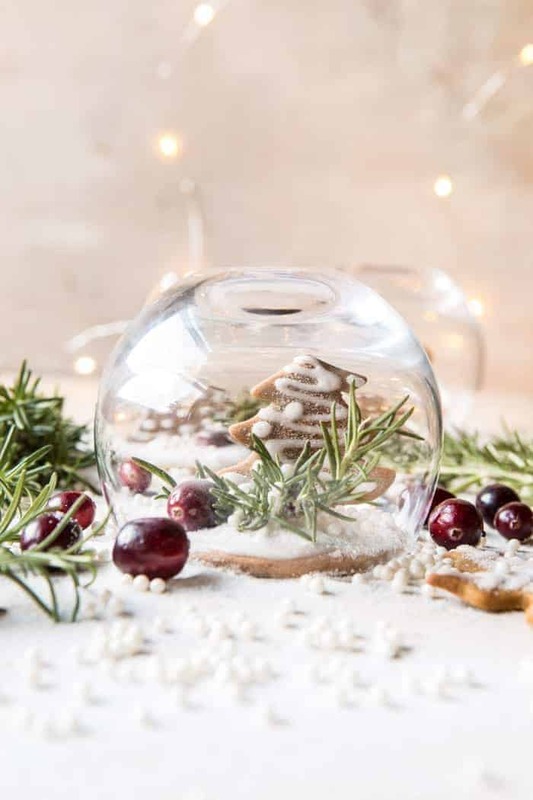 These snowglobes are not only cute, but they're easy to make and use supplies found in your kitchen! 1. Line two cookie sheets with parchment paper. 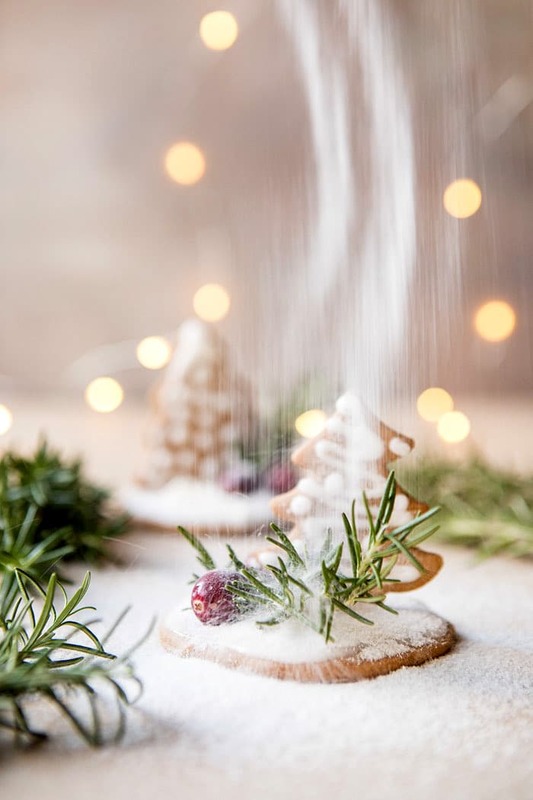 In a small bowl combine the flour, ginger, cinnamon, cloves, nutmeg, salt, and baking soda. 2. In a large bowl, using an electric mixer, cream together the butter and brown sugar, beating until light and fluffy. Add the molasses and egg, beat until combined. Gradually mix in the dry ingredients until no streaks are showing in the dough. 3. Divide the dough in half. On a floured surface, roll the dough out to a 1/4 inch thickness. Using a 2 inch round cookie cutter, cut out 9 circles. 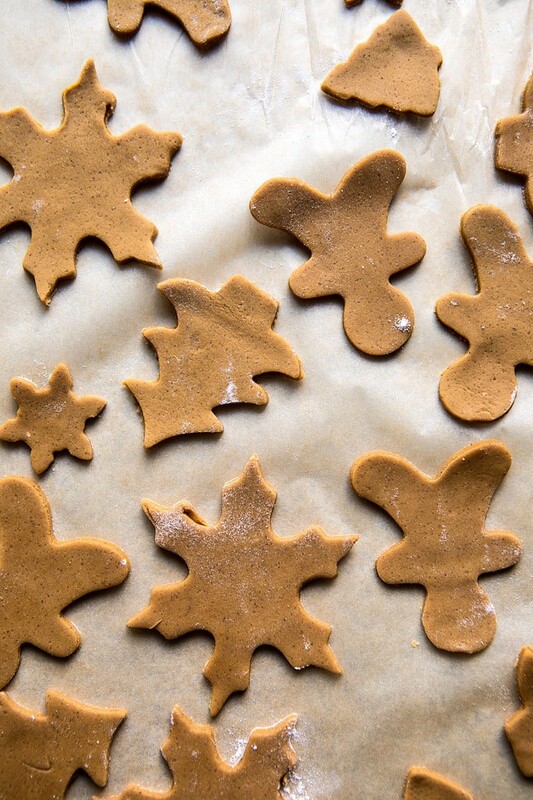 Transfer the cookies to the prepared baking sheet. 4. 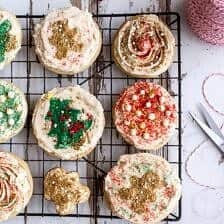 Using the remaining dough, cut out shapes with small cookie cutters (use cutters that will fit inside your glass), cutting them as close to one another as possible to minimize waste. Transfer the cookies to the prepared cookie sheets. Cover the baking sheets and place them in the freezer to chill for 10-15 minutes. 5. Preheat the oven to 350 degrees F. Bake the shaped cookies for 8-12 minutes or until just set. Cool on a cookie sheet. 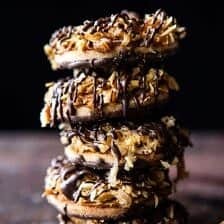 Now, bake the circle cookies for 8-12 minutes or until just set. 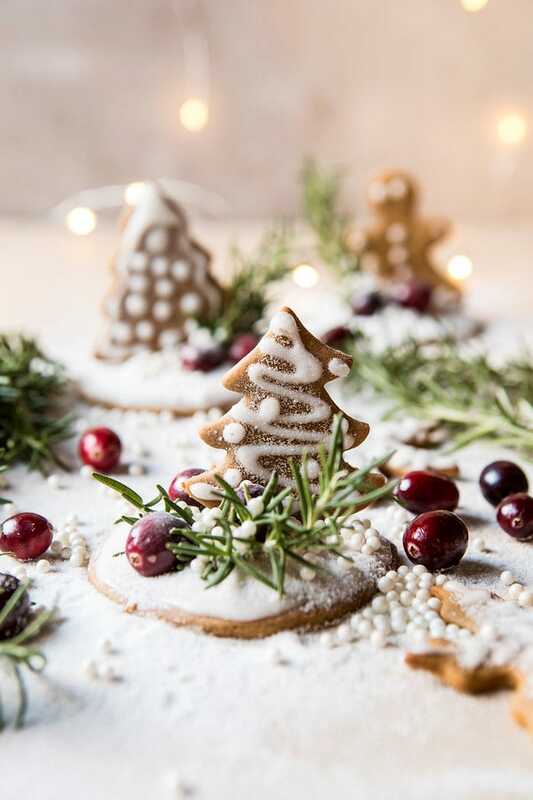 Remove from the oven and immediately indent each warm cookie with the bottom of a shaped cookie (i.e gently push the bottom of a Christmas tree cookie into the center of the circle cookie). 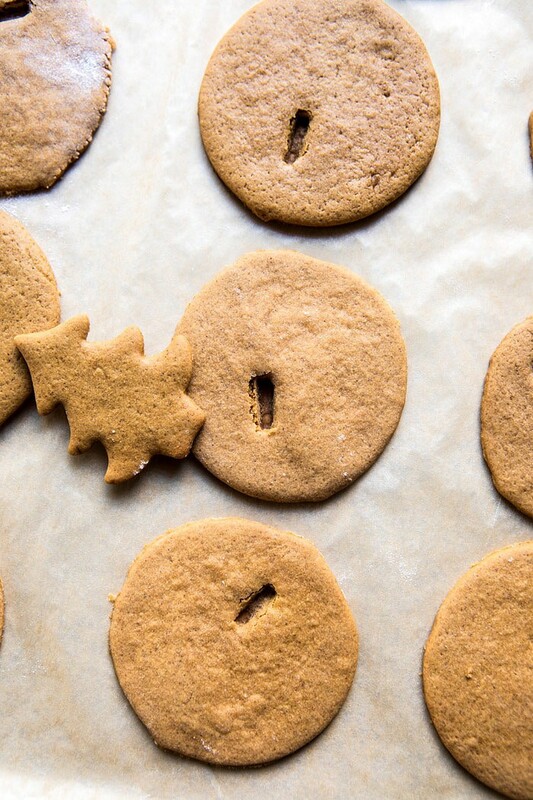 You'll want to do this while the circle cookies are still warm. Let both sets of cookies cool. 6. To make the icing. Add the powdered sugar, vanilla and 6 tablespoons water to a large mixing bowl. Whisk until the icing is glossy. Add more water, 1 tablespoon at a time, until your desired consistency is reached. 7. 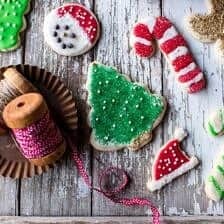 Frost and decorate the shaped cookies as desired and let sit 10 minutes or so to dry. 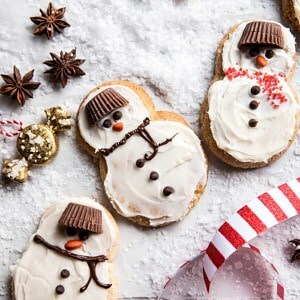 Frost each circle cookie with a thin layer of icing, spreading the icing over the indent you previously made. Now take a cookie shape and insert it into the frosted indent. Hold the cookie in place for 30 seconds to secure. Let dry and then decorate as desired. 8. 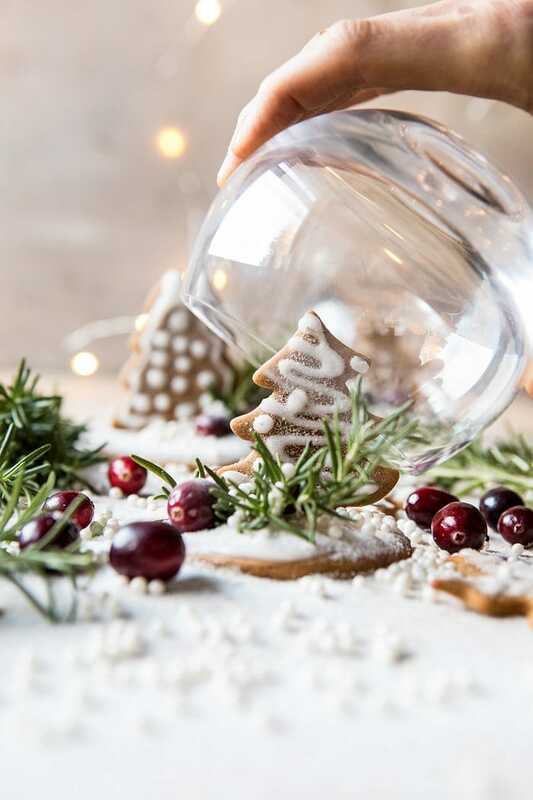 To make the snowglobes, place the assembled cookies on a plate and carefully place a stemless wine glass overtop of the cookie. I am so glad you are liking the book! I hope you enjoy the recipes in it Buffy! Thank you! I am so glad you enjoyed those cookies! I hope your mom did as well 😊 Frosting the guests initials in the tree would be so cute! Totally want to see those if you end up making them! Thank you Kristin! So adorable, I love this idea! adorable and creative! 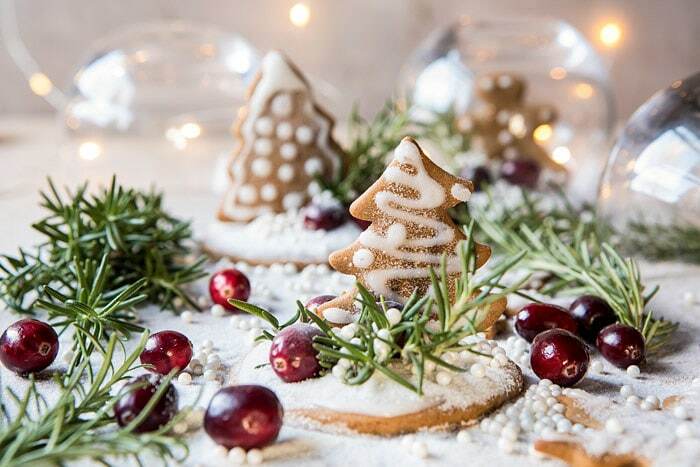 what a wonderful place setting idea, thank you, love that they’re actual gingerbread cookies too! Thank you Sabrina! I am so glad you like these! STAHP ITTTT!!! These are TOO cute, Tieghan!! It looks so simple but I feel like mine would look like a pre-school art class!! 🤣 Merry Christmas!! Thank you Caitlin! I am sure yours would turn out amazing, I hope you make these!